Over the summer, a sweet reader-friend asked if I had made a “scope and sequence” for this list of attainments. She wanted to find something that put these skills in order of when to start focusing on them. I loved her idea (one of those- “why didn’t I think about that?” things!) 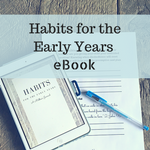 I’ve organized Charlotte Mason’s list of attainments into two sections: skills that can be started (although not necessarily completed) during the early years, and attainments that should wait until formal lessons begin at six. For each attainment, I described what you can do to work on that area. For the attainments that should wait for formal lessons, I added some notes about what you can begin doing in the early years to build a foundation for the skill. If you are hoping or required to do some kind of kindergarten for homeschool, I think this list will be especially helpful! *This post contains affiliate links. ! -Tell three stories about their own “pets”- rabbit, dog or cat. Your child will learn this through the home atmosphere, and through observing their pet friends everyday. -To keep a caterpillar and tell the life-story of a butterfly from his own observations. If the thought of capturing caterpillar eggs and raising them overwhelms you, there are kits available! This is the one we plan on getting next spring! -To describe the boundaries of their own home. By playing outside often, and observing the world around them, your child will learn about their neighborhood and immediate surroundings. –To describe any lake, river, pond, island etc. within easy reach. When taking nature walks or spending time at nearby parks, ask your child to “paint pictures” of what they see by verbally describing it in detail. This will increase their observation skills and vocabulary. -To know the points of the compass with relation to their own home, where the sun rises and sets, and the way the wind blows. This can be started before formal lessons during your child’s outdoor exploring time, as a playful way to explore. First, let your child learn about directions by observing the sun. Their understanding of direction will continue to grow from there. -To be able to describe 3 walks and 3 views. Take nature walks with your child, drawing their attention to what they see. -To mount in a scrap book a dozen common wildflowers, with leaves (one every week); to name these, describe them in their own words, and say where they found them. During the early years, your child will probably learn to name a few flowers and trees by observing and exploring with you. This should be gentle and natural learning! Read books about nature, pay close attention to flowers and trees together, and if you are struck by curiosity, look up the plant in a field guide. -To do the same with leaves and flowers of 6 forest trees. Encourage your child to learn about trees as described above. -To know 6 birds by song, colour and shape. -To name 20 common objects in French, and say a dozen little sentences. Foreign language lessons should begin in the early years, when it is easier for children to repeat the accent. “The daily French lesson is that which should not be omitted. That children should learn French orally, by listening to and repeating French words and phrases; that they should begin so young that the difference of accent does not strike them, but they repeat the new French word all the same as if it were English and use it as freely; that they should learn a few– two or three, five or six– new French words daily, and that, at the same time, the old words should be kept in use- are points to be considered more fully hereafter.” Home Education, page 80. -To sing one hymn, one French song, and one English song. -To send in certain Kindergarten or other handiwork, as directed. -To recite, beautifully, 6 easy poems and hymns. Before formal lessons, read beautiful poems to your child, and sing hymns with him or her. -To recite, perfectly and beautifully, a parable and a psalm. -To add and subtract numbers up to 10, with dominoes or counters. -To read–what and how much, will depend on what we are told of the child. -To copy in print-hand from a book. During the early years, your child can learn to form their letters in a tray of sand, or with another medium that uses gross-motor skills (meaning: moving the whole arm to write instead of just the muscles in the hands and fingers.) In addition to the sand tray, Charlotte Mason recommended having young children write letters in the air. -To tell quite accurately (however shortly) 3 stories from Bible history, 3 from early English, and 3 from early Roman history. Young children shouldn’t be made to narrate passages, but they might choose to! Exposing them to beautiful living books in the early years will train their minds to attend to details, which is necessary for this future skill of narration. We have a morning time to be sure we’re reading good books each day! Phew…that was a lot! But I hope that by breaking it down, you can see how the smaller pieces fit together! Where can I find a printable of this? I’m so glad you wrote this post! I have see the list on Ambleside and been overwhelmed. This seems much more digestible :). You don’t, by chance, have a printable? I’m thinking it would make such a nice sort of checklist to add to our binder so that it’s right in front of my face daily. Cindy, this is a great suggestion! I made a quick printable and am sending it out with my newsletter on Wednesday 🙂 Thank you! !